At [OV]Christian Academy and Preschool, God’s love is learned through lessons that are woven through all of our disciplines so that they become a meaningful and treasured part of each child's growth. Our program is designed to encourage your child’s growth socially, emotionally, physically, intellectually, and spiritually. We want to partner with you in your child's development by offering a curriculum that is built upon the foundation of God's Word. Our classrooms present a fun and safe environment in the midst of a beautiful neighborhood and beach community. [OV]Christian Academy campus is located in the Pinewell section of Ocean View, a quiet neighborhood with pine trees and the scent of the sea in the air. Our classrooms are designed to be an inviting play and work space that provides many opportunities for children to explore as they develop social and academic skills. Classrooms facilitate center-based learning; centers typically include a dramatic play area, art center, block area, science/discovery table, sensory tables. Child-sized tables, chairs and pillows enhance the loveliness of each classroom and help children feel comfortable. Our classrooms have adjacent bathrooms with preschool size fixtures. The Infant & Toddler classrooms offer viewing windows permitting parents to observe their child at any time. In our Infant room, we have padded floors to aid those learning to crawl as well as a table with high chairs built-in for play and feeding. Infant classes do not exceed 12 children taught by a teacher and assistant teachers. The toddler classes do not exceed 15 children taught by a teacher and assistant teachers. The Infant classroom ranges in age from 6 weeks to 17 months and our Toddler classroom ranges in age from 18 months to 29 months. We provide a Christ-centered curriculum where children learn through exploring, experimenting and play in a carefully planned classroom. This planned structure provides children space for self-initiated activities, group participation practicing social skills as well as activities that are teacher-guided. WEE Learn is grounded in evidence-based practices, programs using the WEE Learn philosophy and curriculum work to support children and families. 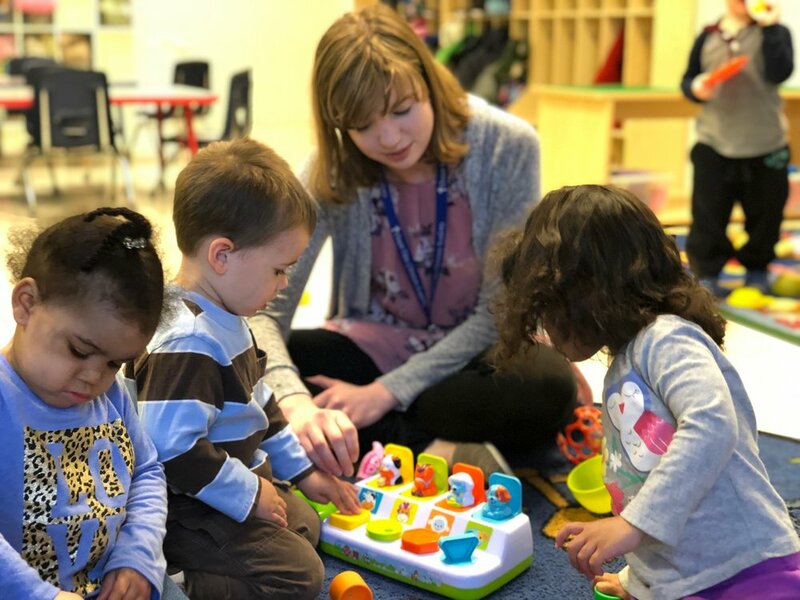 Children’s individual differences and learning styles are considered as they learn through play and interactions with supportive early childhood teachers to maximize each child’s learning potential.